Firefox 4 Beta 10 is out – it’s time to upgrade! I downloaded Firefox 4 Beta 10 yesterday on my Mac. It was released just days after Beta 9 and I’m not sure what all the differences are between Beta 9 and Beta 10 are but I had been using Firefox 4 Beta 9 since it was released and I really liked it, so I downloaded Beta 10 to stay up-to-date. Firefox 4 Beta 9 was the first version of Firefox 4 I tried out. Previous to that I had been running on 3.6.13 and I found it quite buggy. It would quite often freeze up completely, requiring me to force-quit it and it is not like I have a huge number of Add-ons installed. Anyway, Firefox four is a huge improvement. It runs extremely quickly, is very stable and from an aesthetic point of view it is a really gorgeous browser (not often you hear me say that!). Even things as mundane as adding a link in WordPress look fabulous compared to the same dialog in Safari (v 5.0.3). There are other cool features associated with Firefox 4 as well (like the ability to sync tabs etc. across machines, new Add-on management, tab organisation – I really needed this one! and more) and they are all outlined on the Firefox 4 Beta 10 features page. Many of them you’ll probably never use but for me, the beauty of this browser and its stability are enough for me – I’m not going back to Firefox 3 again. Firefox 3.0b4 was released overnight and it is a significant improvement over the already superb 3.0b3! The browser space is really improving of late, what with the release of the surprisingly good Internet Explorer 8 beta, the nightly Webkit releases, and now Firefox 3.0b4. On trying the Acid3 test (Firefox 3.x passes Acid2) it scores a creditable 65/100, up from 61/100 for b3 but still seriously lagging behind Webkit’s 87/100. Improvements to the user interface: better search support in the Download Manager, ability to zoom entire page or just the text, continuing look and feel improvements on Windows Vista, Windows XP, Mac OS X and Linux. Richer personalization through: location bar that uses an algorithm based on site visit recency and frequency (called â€œfrecencyâ€) to provide better matches against your history and bookmarks for URLs and page titles, as well as an adaptive learning algorithm which tunes itself to your browsing habits. The only downside to Firefox 3.0bx is the lack of working plugins but once you try it for a couple of days, you will find it difficult to go back to Firefox 2.x – even with all your plugins! I wrote a post a few weeks back comparing the speeds of various browsers and Microsoft’s current browser, Internet Explorer 7, was the slowest browser by a long margin. 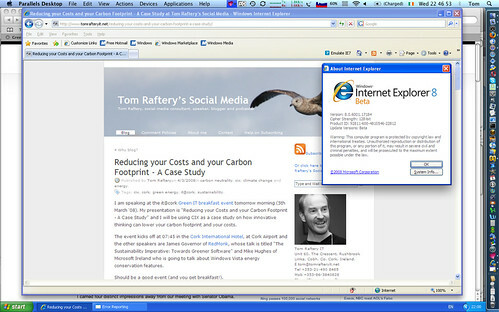 Opera’s CTO HÃ¥kon Wium Lie was quoted recently making some very valid criticisms of Internet Explorer 7. However, Microsoft seem to have addressed many of those issues in Internet Explorer 8. I downloaded and installed it on my Mac last night (in the Parallels partition with XP as the OS). It seemed to work well enough so I loaded up the Acid2 test and was surprised to find that it rendered correctly! This was a good sign! There is still a lot of work to be done on IE8. It crashed several times on me when I was using it and it fails the Acid3 test miserably (17/100 compared to Firefox 3.0b3’s 61/100 and Webkit’s thoroughly respectable 87/100!). Still, this looks like Microsoft are finally taking a step in the right direction with IE8. I am looking forward to seeing the final release. UPDATE – I installed Internet Explorer 8 on my Vista laptop this evening (the same one where Webkit runs the test in 9,094.2ms) and IE8 completed the test in 19,906.4ms. This is roughly the same as Firefox 3.0b3 and is a vast improvement on the 66,870.6ms which IE7 took. Since writing the post Firefox has released Firefox 3.0b3 and Robert made me aware in the comments of the previous browser speed post that Opera 9.5 beta was released so I decided to check those two browsers as well. So while the Opera 9.5b browser is the second fastest browser tested and is showing very respectable times, it is still taking nearlt twice as long as the Safari Webkit browser to render pages. Note, I re-tested the WebKit so that the results of these browsers would be directly comparable. It is also worth noting that Firefox 3.0b3 is significantly faster on Vista than was Firefox 3.0b2 while on OS X Firefox 3.0b3 is only marginally faster than Firefox 3.0b2. After reading Seth Weintraub’s post on how the upcoming versions of Safari are blisteringly fast I decided to download the latest nightly (WebKit r30123) and check it out for myself. That’s pretty spectacular performance – and seeing as I use Safari quite a bit on my iPod Touch, I may just have to switch default browsers for a while to see how I get on with Safari Webkit! Microsoft announced yesterday on the Internet Explorer blog that the next version of Internet Explorer (IE8) will correctly render the Acid2 test page. See the excellent Channel 9 video for more. The Acid2 test should render correctly on any browser that follows the W3C HTML and CSS 2.0 specifications. Any browser which does not correctly and completely support all of the features which Acid2 uses will not render the page correctly. 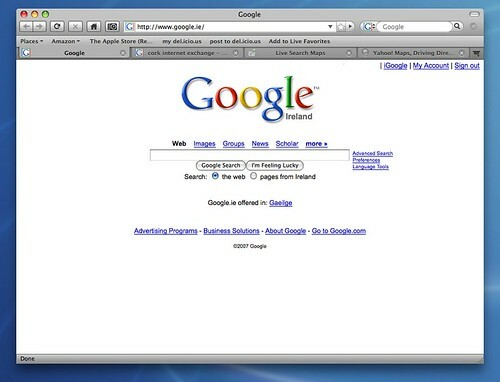 Apple’s Safari passed the Acid2 test in October 2005! Firefox 3 is expected to pass the Acid2 test as well when it is released (beta 2 already does). Internet Explorer 8 is due to ship in the first half of 2008, as is Firefox 3 so it looks as if 2008 will be the year of the standards compliant browser! Ironically the official Acid2 web page is broken today (!) but it is mirrored on one of the developers sites so you can test your current browser there. I started using Firefox 3.0b1 a few weeks back as my primary browser (in general it is not advisable to use beta software on a production machine). In that time it has been incredibly stable and not at all resource hungry. This morning I noticed that Firefox 3.0b2 was released yesterday. I took a quick look over the release notes, then I went to the download page, grabbed a copy and installed it. It is running really smoothly and apart from the lack of add-ons, I’m loving it. The Proto Theme does work and makes Firefox 3 look even better. I downloaded and installed the beta version of Firefox 3.0 a few days ago and have been using it since on my OS X Leopard laptop. I also installed the Proto theme for Mac Firefox which significantly enhances the look of Firefox 3 on the Mac. My initial impressions of Firefox 3.0b1 are very positive. It is fast, stable, looks really sweet and many of the memory issues which have dogged Firefox appear to have been fixed. To expand on the memory comment, in Firefox the memory used to leak so the longer it remained open, the more memory it consumed. I have had Firefox running on this Mac now for several days with up to six windows open some of which have up to twenty five tabs running. Currently this is using 1.38gb of virtual memory. At the same time, Safari which has one window open with two tabs running is consuming 1.41gb of virtual memory! Another change is the ability to Star and Tag bookmarks. Personally I prefer the way Flock allows you to bookmark directly into Del.icio.us. One disadvantage of running the Firefox beta is that none of my favourite plugins now work but at least Del.icio.us have a bookmarklet which runs well out of the bookmarks toolbar so I can still bookmark there from Firefox. Overall, I like it. It seems much improved, more responsive and less of a memory hog. Shades of good things to come! Since I updated this blog to WordPress 2.3 and K2 RC2, I have been having reports that the blog crashes Safari (but only Safari 2, not Safari 3). Today I think I sorted the problem. I switched the blog from using the native WordPress’ Widgets to manage the sidebar to using K2’s Sidebar Manager and now the crashing seems to have stopped. I’m not sure why the WordPress Widgets was causing the blog to crash Safari 2 but if you are having this problem, try switching to using the K2 Sidebar Manager.